“Classical camping,” as we know it, is still pitching a tent. The practice is ancient, of course. Our ancestors knew it well. The famous Airstream trailers hit the road in the 1920s. Motor homes increased in popularity in the 1930s though high prices discouraged many RV campers. The creation of the interstate highway system in the 1960s helped foster the growth of what we now see in huge 40-foot RVs. But some things don’t change and Florida has long been a favorite place to camp. What are the benefits of camping in the Sunshine State? The favorable climate, escape from the bustle of urban lifestyle, and affordability all make Florida a prime place for camping out. We’ll mainly save the RV places for later and concentrate here on the top spots for “classical camping.” Since Florida has a long list of beautiful campgrounds, it should come as no surprise that narrowing this list down to 10 wasn’t easy, but here are the best. Each year, this park welcomes hundreds of thousands of visitors from all over the world. No wonder. It has it all: camping, nature trails, four miles away from the beach, and even nearby historical sites at the nation's oldest city. The 1,600-acre park has concessions to rent anything from bicycles to kayaks. There's also a gift shop and Wi-Fi connections. Remember to book ahead because this place is popular. And don't miss a chance to visit the nearby historic coquina rock fortress, Castillo de San Marcos National Monument. The first underwater park in the U.S. is a 70-acre oasis where the most popular activities are canoeing and kayaking. The coral reefs and marine life bring most visitors here. There are glass-bottom boat tours and fishing is also permitted in designated areas. Visitors take short trails to hike, picnic or walk to the beach for swimming. The visitor center has a 30,000-gallon saltwater aquarium. Its best claim to fame is being in an unspoiled area of old growth and heavily-shaded hammock trees with easy access to city amenities. There are waterfront RV sites, tent sites and cabin rentals on the tropical Myakka River. The tent section has electrical and water outlets. Nearby Venice is not a big city but offers enough upscale dining and village shopping to surprise most visitors, as well as miles of free sandy beaches. Malls and antique shops near downtown allow visitors to buy just about anything. Hiking and beach activities are the most popular things to do at this 200-acre park located on a barrier island, Santa Rosa Island. It's part of the Gulf Islands National Seashore. Many trails wind through the white sand beaches. The campground has 180 sites with electric and water hookups. Nearby Fort Pickens, a walkable one mile away, dates back to 1834. It may be the best preserved fort in the U.S. Just FYI: the fort was one of only four in the South that were never occupied by Confederates during the Civil War. If you really (really) want to get away, this park offers the wild side. That is, thousands of acres of backcountry camping with miles of multi-use trails to explore. Backcountry generally means carrying all of your own supplies on your back or in off-road vehicles. Be aware that camping permits are required, though they are free and can be filled out online. They are also available at backcountry trailheads and visitor's centers. There are also posted daily limits when maximum numbers are reached. The largest subtropical wilderness in the U.S. covers 1.5 million acres over three counties-Monroe, Miami-Dade and Collier-with three ways to access it by vehicle. The main entrance is in Homestead. It's the protected habitat for many endangered species like the manatee and the rarely-seen Florida panther. Camping is available year-round and the area offers both front and backcountry camping. Make sure to bring your own equipment! So you want to get away to a deserted island? Not quite, but the only way to get here is by boat. This is an uninhabited barrier island that has exactly these facilities: none. Nada. No places to buy food and you can swim, but no lifeguards. The island is just over two miles long but the entire preserve covers 1,700 acres. But much of that land is off-limits because it is a wildlife preserve. Only certain areas allow camping, and permits are required. They are free from the county. If you want quiet, go during weekdays because lots of recreational boaters come here to party on weekends. There's a lot to like about this place but perhaps the very best thing is that you can sleep out by one of the 60-ocean side campsites. It is also the only state park where you can walk 100 feet from your campsite to catch a bonefish. Birding is also popular here. There are several nature trails, including the one-mile Golden Orb Trail, which goes through five natural communities. Rare birds such as the Key West Quail Dove are found here. Another walking route, the Layton Trail, goes along bayside water. This long-standing park has showcased sparkling springs in a subtropical setting since the 1930s. It has 79 shaded spaces within walking distance of some of Florida's most beautiful springs. 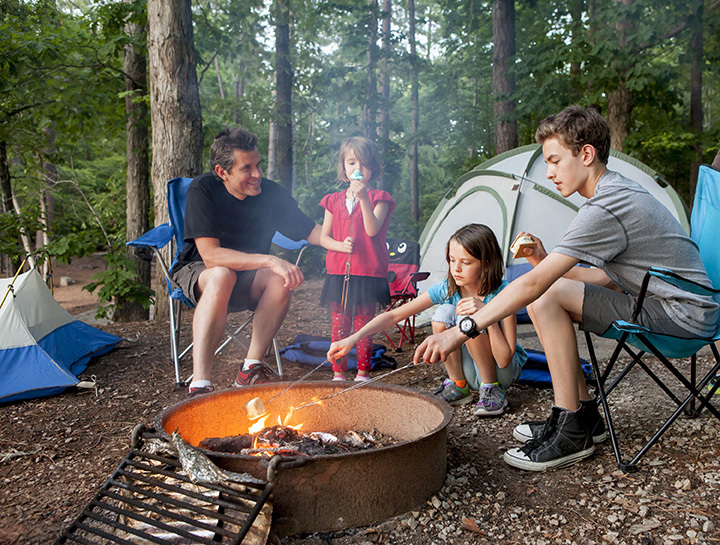 It was named one of ReserveAmerica's "Top 100 Family Campgrounds" in the U.S. The spring is unlike any other found in the U.S, with hundreds of springs gushing out of crevices in the earth…all beneath a dense canopy of tall palms and oaks. One of the most popular activities here is canoeing. Not everyone wants to get away from civilization by camping. That helps explain why, in common with the rest of Disney World, their Fort Wilderness invariably continues to get the highest ratings. Well, why not? Families save money by paying Disney $30 to set up tents. Bathrooms and showers are plentiful and nearby. Check-in times of 1 p.m. are relatively early. All the entertainment anyone could ask for is right here at the camp. Everything is maintained in typical first-class Disney fashion. There's fireworks and a free Chip 'n Dale campfire sing-along each evening.